Project updates, roleplaying advice, and game design posts. I’ve been perpetually struggling to keep up on my reading even as I double down on work and writing. Last week I read The Mere Wife, a novel (affiliate link) by Maria Dahvana Headley, and I found it quite interesting. I’d say that this is a bit of an understatement, but it’s a good summary of the book in the sense that you should get an idea of what it is so you can decide whether you’re interested in checking it out further. If you’re not sold, however, I strongly suggest that you check it out. It’s an interesting, compelling read. Image courtesy of Amazon and Macmillan. The whole novel is told in this delightful style, something that falls nicely between stream-of-consciousness and more traditional styles. The result is a book that is occasionally confusing, but only so much so as the complications of reality are to its characters’ minds. Most of the time, it manages to combine the sort of crisp and clear imagery that one rarely finds outside of epics; I found myself frequently thinking of Homer and Beowulf as I looked at the language and deep descriptions, which are tremendously indulgent but have a sense of action to them, something that you see with many works that belong to an oral tradition. Thematically, it’s heavy. Many of the themes discussed relate to PTSD, family drama and infidelity, and violence. It’d get a nice graphic R rating if it were made into a movie. However, while The Mere Wife may occasionally veer into the realm of the grotesque, it does so no more than sacrosanct myths. 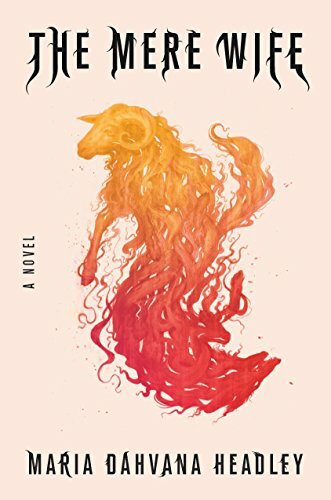 Where it resorts to vulgarity it does so to depict life as it is, and while I wouldn’t be passing it out on a middle-school reading list, I’d definitely recommend it to a mature reader, especially one who has already become familiar with Beowulf. Indeed, one of the things that struck me as I read The Mere Wife is how close it manages to feel to that epic. The three act structure is maintained, though it is different, and the characters are all closely drawn from the original myth, but given their own life and meaning. Honestly, even if you haven’t read Beowulf, I can still recommend The Mere Wife. The protagonist, Dana, is based off of the character of Grendel’s mother, who is barely a footnote in the original epic but comes to life throughout the novel as a tragic figure. The tragedy plays deeply into the American consciousness, but also in general to the world of the 21st century. The loss of mysticism, digital panopticon, paranoia in the war on terror, and racial tensions of our day all are developed into themes and touched upon, questions that are answered, unanswered, and explored. Universally, The Mere Wife puts us into the shoes of its characters. Loathsome or ennobling, each gets a fair shake, and we are left feeling sympathy for all of them. It lives up to the legacy of sagas and epics, and I was able to get through all 320 pages of the tale in just a couple days, finding every excuse possible to read it. Say it. The beginning and end at once. I’m face down in a truck bed, getting ready to be dead. I think about praying, but I’ve never been any good at asking for help. I try to sing. There aren’t any songs for this. All I have is a line I read in a library book. All shall be well and all shall be well and all manner of thing shall be well. In addition to writing here, I run Loreshaper Games, an indie game development company dedicated to free, fun games. You can find us over at http://loreshapers.net or on Steem and Twitter. Outside of Loreshaper Games, I also have a Wattpad account, where I post my essays and fictional writings.